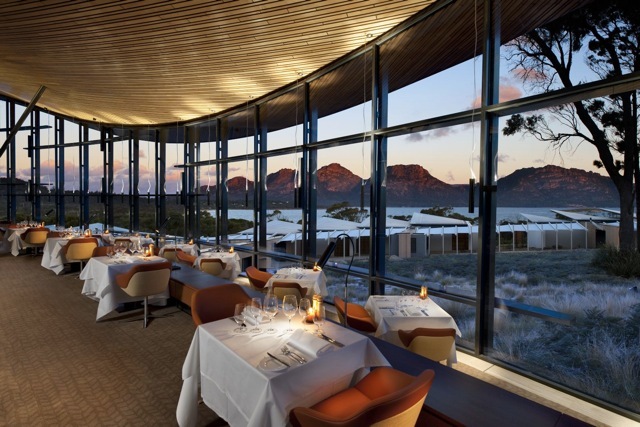 Saffire Freycinet, is a luxury boutique resort set in one of the most beautiful locations in Tasmania’s East Coast in Australia. Saffire is active in keeping the environment safe by conserving the rain water, using minimal of night lighting, using natural cycle air flow systems, insulation, and more. at Saffire are designed and furnished in a sleek, unique, and upscale way. All suites offer magnificent views of the mountains, white sandy beaches and crystal-clear blue waters. Features of the 20 suites include king beds, LCD screen TV and DVD players, double shower and bath, courtyard and deck, and iPod music system. Deluxe room rates include breakfast, lunch, mini-bar deluxe beverages until 6pm, Internet access, and Saffire activities. ll conference gatherings as well. The attractive boardroom hosts up to 20 guests and includes tea and coffee. Dining the resort restaurant, Palate offers local produce served from early morning to late evening. sure to experience the unique luxury Spa treatments at Saffire. Therapists are trained by celebrity facialist Marionne De Candia. Deluxe and Luxury suites guests are gifted 60 minutes of treatments whereas Premium suites include 120 minutes of free treatment package. Relax and refresh your face and body with treatments like complexion cleansing, exfoliation, toning, body scrub and relaxing massage. The gym at Saffire offers worthwhile workout experience with latest equipment, including cardiovascular equipment, running machine, gym balls, cycle machines and universal unit. Rates for deluxe suites start at just over $1,000 per night.